From the demo at the show, it’s clear that the fundamentals of the series are there: You trudge through abandoned Elven hallways with the guidance of a sturdy shortsword on the side of the screen. You slash the throats of the verminous ghoulies. You smash open a select offering of pots and urns, which deliver bundles of gold to your coffers. If those are your only prerequisites for a Bethesda-ordained Elder Scrolls RPG, then you will be satisfied. Unfortunately, most people come to this franchise to waste time on gorgeous mountainside outcroppings, to outrun the cops in Imperial City, and to talk to every NPC they can find in a 500-mile radius. If that is the mobile fantasy you’re looking for, Blades won’t speak your language. That being said, Blades is still hugely impressive. Bethesda may not be capable of porting the entire province of Skyrim to iPhones just yet, but they’ve managed to figure out a competent condensation that gets the moment-to-moment right. The Blades dungeon I experienced was fairly linear, but I still had free rein to explore the corners and alcoves of each room I entered by simply tapping wherever I wanted my character to go next, point-and-click style. Combat is rudimentary but reasonably satisfying: You hold down a space on the screen to wind up a slash, and let go when you’re happy with your angle. 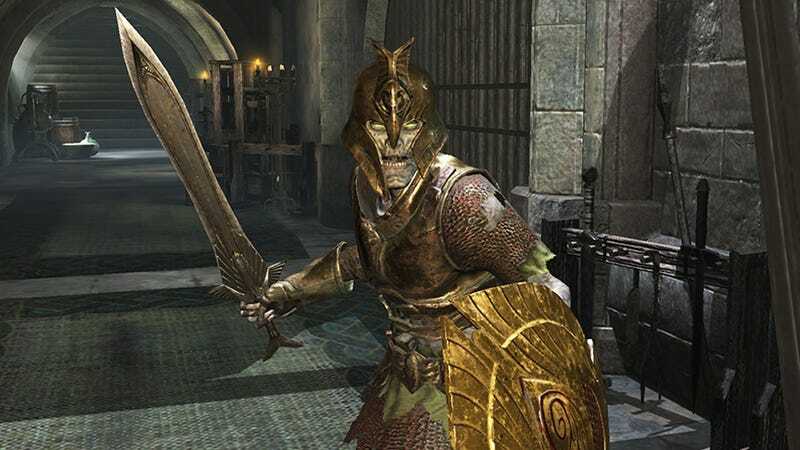 This system lets you time your swings for when the skeleton across from you puts their shield down—the basic cat-and-mouse routine you’d expect from Elder Scrolls’ consistently simplified swordplay. I also had a couple spells on a generous cooldown across my bottom bar. Blades is also the first game in the series to implement those tried-and-true floating damage numbers that spark out of the heads of your enemies. Take that for what you will. Everything I killed dropped gold coins and mysterious green gems—no armor or armaments. Considering Blades’ free-to-play nature, it seems likely that those doubloons might tie into some sort of monetization model. The inventory screen for my character was also surprisingly modular: boots, gauntlets, helmets, etc. The Elder Scrolls has never really been a franchise about loot-lust, given its genial level-scaling overworld, so I have to imagine that its mobile incarnation will feel more like Diablo as far as the gear grind goes. At Bethesda’s press conference, Todd Howard went long about Blades’ campaign, in which you return to your razed home city and make a commitment to rebuild and re-populate it, summoning useful residents, decorations, and corresponding side quests along the way. I didn’t get to see any of that up close, but I do think some context and stakes would’ve made my time with Blades feel a little less formless. Mobile games prey on our spare moments on the train or the bus, and the idea of cutting through a few callow goblins to earn the funds to upgrade the blacksmith back home certainly sounds like a worthy time-waster. But so far, at E3, Blades revealed itself as a tentative first step toward proof that the basic calculus of The Elder Scrolls can exist on a cell phone. Hopefully it will fill in the rest of the gaps before the game launches in the fall.